Public Justice’s Coal Ash Litigation Project, part of our Environmental Enforcement Project, protects communities and wildlife from toxic pollution, and forces coal companies to confront and pay the full cost of the damage they do. Below is a brief introduction to how and why we do it. Coal ash is a toxic byproduct that is left over after coal is burned. Coal ash must be disposed of after it has been burned, and coal-burning power plants create a great deal of which they need to dispose. What is in coal ash that is harmful? A number of carcinogenic, toxic, or otherwise dangerous chemicals are present in coal ash. These include arsenic, boron, cadmium, mercury, lead, and selenium. According to the Sierra Club, the threats to communities adjacent to coal ash impoundments include “increased risk of cancer, learning disabilities, neurological disorders, birth defects, reproductive failure, asthma, and other illnesses.” An EPA risk assessment found that living near a wet coal ash impoundment is more dangerous than smoking a pack of cigarettes a day. These chemicals are harmful to the environment as well as to humans. They kill plants and animals, and in doing so, disrupt whole ecosystems. The buildup of toxic pollution in plants and animals affects humans as well, when those plants and animals enter the food supply. What is a coal ash impoundment? Often power companies dump coal ash as slurry in open pits called coal ash impoundments. Since the collapse of the dam of a coal ash impoundment in Kingston, Tenn., in 2008, which contaminated thousands of acres and necessitated a $1.2 billion cleanup, power companies started to move away from wet coal ash disposal. This trend was reinforced by the exposure of massive pollution at the largest impoundment in the nation, Little Blue Run in 2012. More recently, a spill of ash into the Dan River in North Carolina has highlighted the hazards of impoundments. However, despite the danger to drinking water sources and freshwater aquatic life that comes from disposing of wet coal ash in impoundments, not to mention the threat contamination poses to the bottom line of power companies since the Kingston disaster, they continue to do it. How does coal ash get from these impoundments to bodies of fresh water and the water supply? Water from coal ash impoundments leaks into the ground directly, bringing the toxic chemicals with it. The installation of groundwater monitoring equipment at impoundments, and the use of a device called a composite liner, safeguards which Physicians for Social Responsibility refers to as “rudimentary”, help prevent leakage from coal ash sites that use them. However, as of February 2014, only three states mandate the use of composite liners, and only two require groundwater monitoring systems at wet coal ash disposal sites. Data released by the EPA in 2012 showed that 535 impoundments, or about 46 percent of those the agency knew about, operated without a composite liner. 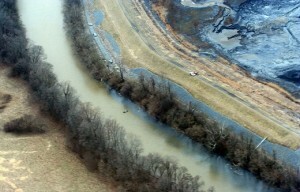 Minefills are an alternative route for coal ash disposal in certain regions that have been mined historically. They operate like landfills, but with much less pollution control. For example, minefills do not have liners or any treatment of their drainage beyond sedimentation. Although companies make claims that this filling can reclaim a mine (restore it so that it can be economically or environmentally useful as something other than a mine), there is no data to support the idea that filling can reclaim a mine. Indeed, the National Academy of Sciences pointed to significant risks of pollution from the toxics and other contaminants in coal ash. What is Public Justice’s Coal Ash Litigation Project? Hold coal companies accountable when their coal ash harms communities and damages the environment, and win injunctive relief that prevents future damage. When former Public Justice Staff Attorney Richard Webster first visited Craft’s Run, a stream that drains from the Coresco Coal Ash Dump near Morgantown, W. Va., a nearby resident asked if he was there to do something about the pollution. The stream was bright orange (from the presence of iron), and tests showed the pollution was toxic to fish, Webster said. In the headwaters, the stream was healthy, but as it passed Coresco’s minefill it became polluted. Public Justice sued the mining company, and a settlement pending a judge’s approval and that of the government would force Coresco to close the seepages that are causing much of the pollution. The threat to sue by Public Justice and others shut down the largest coal ash impoundment in the country, the 1,000-acre Little Blue Run impoundment. Rather than fight the litigation, the company operating the impoundment settled with the State of Pennsylvania by agreeing to close the facility by 2016. The state also mandated cleanup of the facility by imposing a $169 million cleanup bond, the highest in Pennsylvania history for waste management site cleanup. This case has become a poster-child for the need for better federal regulations on coal ash. Furthermore, if the coal plant Little Blue Run serves is to continue operating, the power company must now spend an additional $200M on conversion from wet ash handling to dry handling and at least an additional $10M per year in operating costs. Make coal companies cover the true costs of wet coal ash impoundment, so that the public does not have to clean up industry messes, and the practice becomes unpalatable to the industry. On behalf of its clients, Ohio Valley Environmental Coalition, West Virginia Highlands Conservancy, West Virginia Rivers Coalition and the Sierra Club, Public Justice settled this summer with American Electrical Power over violations of the Clean Water Act at three of its wet coal ash impoundment facilities. As part of the settlement, AEP is converting one of its coal plants into a dry coal ash facility, the safer and more expensive option. It is closing another one of its plants altogether, in what Webster wrote is a significant decision. Make the damage that coal ash does, particularly wet coal ash disposal that is not federally regulated, clear. This will inspire regulators to ban the use of coal ash impoundments, which will improve the lives of many Americans, and help the environment. By Dec. 19, 2014, the Environmental Protection Agency must finalize its new rules on coal ash disposal. Public Justice hopes it will close America’s wet coal ash impoundments, which would not only help the environment, Webster wrote, but perhaps save the coal companies from the adverse effects of huge spills and increasing pollution liabilities. “Hopefully, settlements with far-sighted utilities like AEP will send the message to EPA that it’s time to save the less-advanced power companies from themselves by phasing out wet handling of coal ash,” he wrote. The continued pressure Public Justice and its allies are putting on power companies will hopefully be enough to convince the EPA that regulating coal ash disposal at the federal level is the only safe option. What are the case selection criteria? The plaintiff has a strong claim against a power company that has adversely impacted the local community and environment. The case is strategically important to the larger fight against coal ash pollution, and there is an opportunity to establish new precedent. The case adds to the geographical diversity of the Project, and to our list of partners and allies. Who does Public Justice work with? Our allies in this fight include Environmental Integrity Project, Sierra Club, EarthJustice, Natural Resources Defense Council, West Virginia Highlands Conservancy, Appalachian Mountain Advocates, Citizens Coal Council, Comité Díalogo Ambiental, and the Southern Environmental Law Center. Does coal ash affect climate change? Fossil fuels are currently heavily subsidized because their price does not include the cost of their pollution on the environment. Economists would say that these huge costs are “externalized” – they don’t show up in the price of fossil fuels such as coal, but the costs are still very real. If carbon-based fuels like coal were priced at their actual cost to the world, they would be uncompetitive with cleaner sources of power. Public Justice’s coal ash litigation project exposes those costs, and makes the power companies pay them. Our successes in taking on the most egregious pollution and polluters is an example of how the civil justice system is helping to chip away at fossil-fuel producers’ privilege, by making power companies face the true cost of using coal for electricity generation, thereby making the costs of renewable sources of energy as competitive as they should be. Fighting climate change cannot be done by litigators alone. It requires strong government action driven by public outrage. But the work Public Justice does through its coal ash litigation makes power companies face their victims and their damage, and pay to set things right. This project is an example of what must and can be done on a larger scale for the sake of the whole planet. Our Coal Ash Litigation Project gets results, and helps create a better future for all of us. Will you stand behind it? Make a 100 percent tax-deductible donation to Public Justice’s Environmental Enforcement Project today.